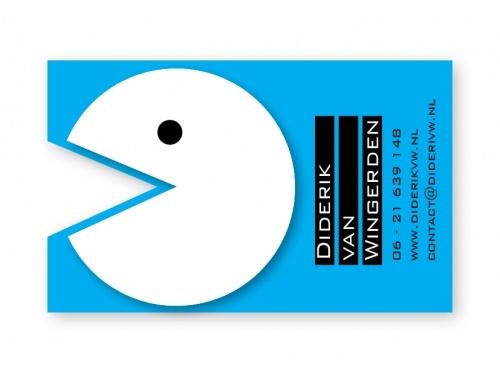 How to get a Unique Business Card that People Remember « Think. Innovation. The problem: I am creative, but not a designer. 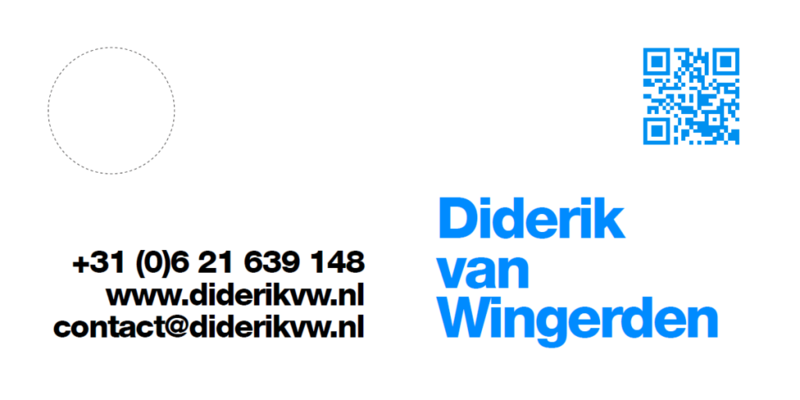 The solution: writing out a challenge on a crowdsourcing platform ontwerpen-voor-geld.nl. The result: well, see on the left (front) and below (inside). There were various good creations to choose from and the winning card went to several iterations before it ended up like this. 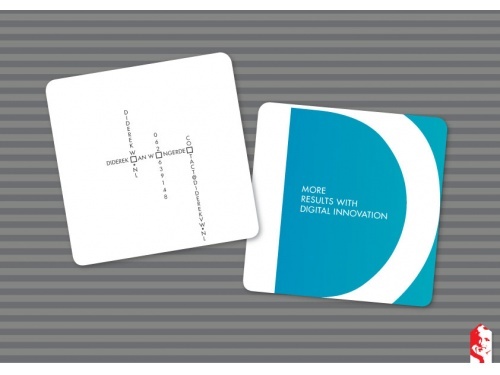 Also, the price for cutting out the circle would drive the price up to 2 euros per card. Way too much in my opinion. So after some trial and error the designer found a device that exactly fit the circle, so I could do it myself. The designer did an excellent job, in the design itself, helping with the iterations, finding the device and assisting in the printing process. Thanks to Agata Pilip for doing such a great job! 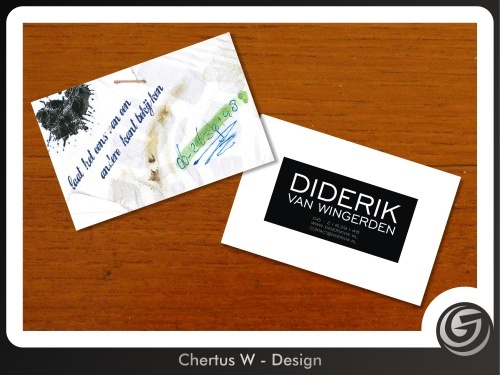 With viral I mean: the idea and design should be so creative that people will talk about my card and hand it over to others, just because of its creativity and uniqueness, expressing me and my personal brand! 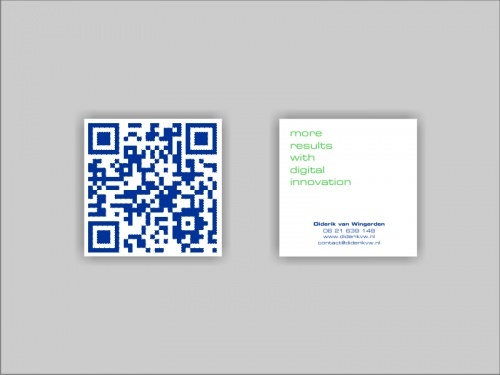 My personal brand: I apply innovative technology for organizations and create results. 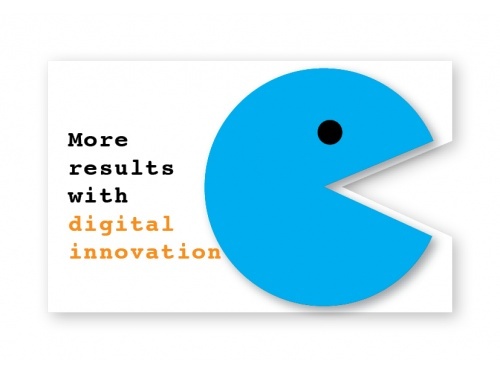 Payoff: “More results with digital innovation”. Feel free to bring up any idea that comes to mind. 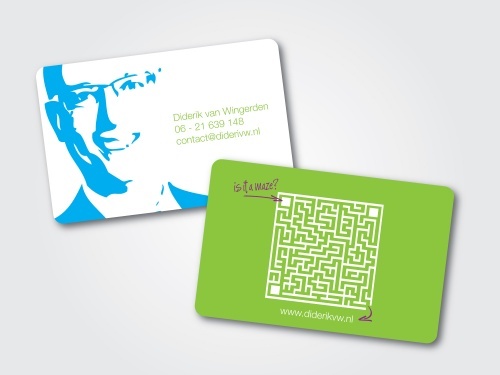 An idea that can be expressed on a business card and that will ‘stick in your mind’. 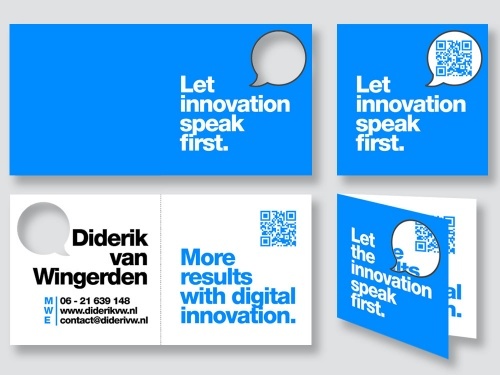 Additional requirements, here’s for the extra challenge: the design should be usable/printable on a regular sized business card, using regular business card paper. Round edges or cut-off of edges are okay. 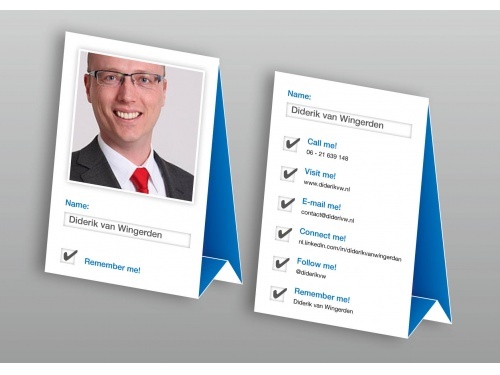 Reason for requirement: people should be able to keep the business card in their wallet and/or together with their other business cards. So if it’s very oddly shaped (size of thickness), they will discard of it. And also: I want to keep printing costs acceptable. To make sure that your ideas are safe and nobody will ‘steal’ them, I have made this a closed project. I am looking forward to your ideas and creations!